Chicken kebabs with yogurt marinade. A Greek dish. This is a lovely recipe & looks very cheffy! Get some free range chicken breast;one per person: cut them up – not too small as they will shrink. Make a marinade of yogurt, garlic, lemon juice, salt & pepper & a good tablespoon of chopped herbs. The usual suspects! Mix your bust in their. leave for an hour. 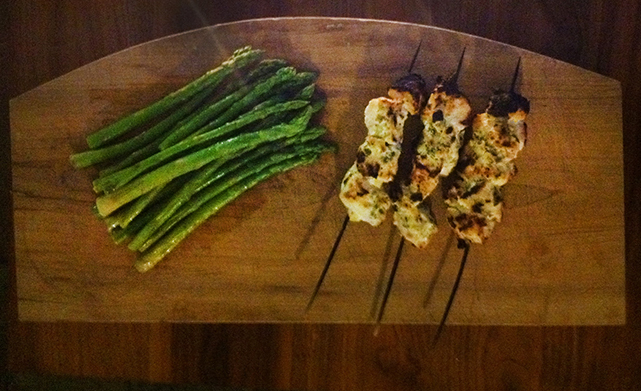 then thread them onto skewers & pop under a hot grill for about 12 – minutes. Baste with extra oil or sauce to keep them super juicy. if they get a tiny bit blackened it only makes it look more authentic! Enjoy.